Way to start a monday, right? Comics to read, comics to write, comics to draw. And, all around the world, the notion that something you did is being read. Hubert Pacheco (or Hub, as he signed his email) is a photographer from Manila, and gets his comics at the same Planet X comics store that Danry, our first Challenges, goes to. Because he already had all the individual issues of the mini series, he decided to improvise on the challenge picture. Nice work. The comic he's reading in the picture is a printed version of the webcomic he's doing with his friend Teddy, called Work in Progress, so I'm including the link for those curious to check it out. Alan Hess got his copy of Daytripper, and mostly all of our previous work. He's a fan from Boston, so he might be glad to know we'll attend the Wizard World New England Comic Con in September 17-18th. Ryan Claytor got his copy at 21st Century Comics in East Lansing, Michigan, right on the first day it hit the stands. For someone so fast on the draw that day (look at his flash-like pictures), he sure took his time to send us a picture, but I'm glad he did. Finally, Taylor Pithers sent this from London via twitter. A pure act of unthinkable impulse, typical of twitter. We're three weeks away from out first big trip, our convention trip to the Lima Comics festival, in Peru, so we'll need to focus more on the working and less on the blogging to get all this stuff that needs doing done in time for the trip. February is over, and it's time to switch gears in our production speed. 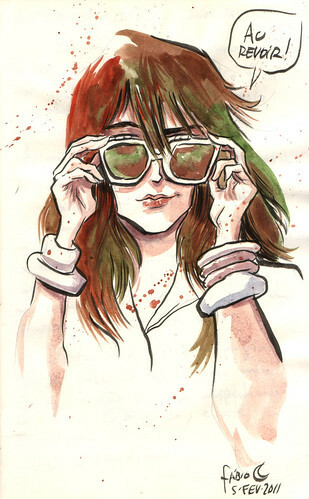 Thanks for all of you who sent pictures, or who reads the books or who love comics. All of the above, separately or together, are enough reasons for us to keep doing what we do. We like to tell stories and we're happy to have people to tell them to. We had an incredibly diverse week here at the Daytripper Challenge centre, receiving letters from all over. Some of them included details or stories of the wheres and the hows and I'll do my best to incorporate it in here somehow. Rémi Gérard-Marchant sent his picture from Paris. He ordered it online, so he decided that the perfect setting for a picture would be in front of the Centre Pompidou because, in his own words, "it would be perfect to have a contemporary art-form together with a contemporary art centre". It made for a really graphic picture, and the blue on the pipes goes really well along with the blue on the cover. Andreas (on the left) and Sebastian are brothers and they ordered it online through Amazon.com. Andreas had to wait 23 days for his copy to arrive to Sweden, so he already read it several times to make up for lost time, and then he made his brother read it as well (as a form of punishment?) and now they agree it's one of the best comics they've ever read. I like when brothers agree on something. Rana is still waiting for her copy of the Graphic Novel, but decided to take a picture in front of Mega-City Comicon, in Camden Town, with her copy of issue 10 of the mini-series. Good luck with your mini-series, Rana, and continue to have fun doing comics. Melissa Evans lives in Adelaide, Australia, where she said that every comic book store in town (there are three) had sold out of Daytripper. She made a reservation on one of the stores for the next batch of books, to make sure she wouldn't miss another chance. The day came and she got her copy at Pulp Fiction Comics (and she wanted to mention that she would like to thanks Adelaide Comics Centre too, because she bought the single issues of Daytripper there, and that's where she buys most of her collection), but you'll notice in her picture she's holding two copies of the book, so there's another story to go along with the second copy. She bought a second copy to give away, and not to a friend, but to a total stranger as an out of the ordinary act. Quite the romantic. As she wandered around her small city, she found this young man sitting under a tree, eating his lunch. She went to him, said hi, he said hello back. When asked, he told her he didn't read comics (which is what she was hoping for), so she asked if he would consider reading one and, when he accepted, she said "Well, I have a comic for you" and gave him the second Daytripper book. He asked if she was the author. "No, it's just a really great story and I'm hoping you'll enjoy it", she answered. They both smiled, he said thanks, and she left, leaving me (yes, me) and everybody reading this curious to find out what will the mystery stranger guy find of the book he so kindly got. Here's the picture of the stranger. I hope you'll enjoy it, too. It's great to see our books in places we've never been. It's the power of stories. Hopefully, one day I'll go to Sweden, Australia, or back to London or Paris. For now, as long as my books get to travel, I'm happy. The Daytripper Challenge continues. We're happy that our book is getting in everybody's hands, and we're thrilled people keep sending us pictures. Jeremy Holt sent us his multi-picture-tale of how he got is copy of Daytripper via Amazon.com, and that he was greeted with it by his girlfriend and their dog, Buddy. As he tells on his email, Buddy is also a great fan of the story and hears it with great attention as Jeremy reads it out loud on the sofa. As the picture show continues, Jeremy reminds us that he also met us in NYCC, where we gave him great advice about self publishing and creator owned comics. I'm happy to see that the interaction with fans and creators in conventions is still a great way to keep people inspired and hungry for more. Back to work around here. I just finished a new cover, and now I'm on my way to do another one. Bá is making some magic on his new Casanova pages, but there are so much to do that it might be a few days before we have enough time to post again. 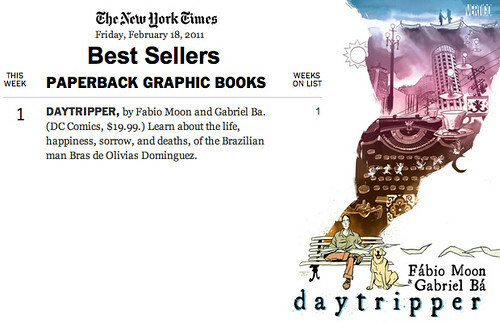 Yesterday we were informed that our Daytripper album debuted in first at bookstores, according to the New York Times Best Sellers list. We were so happy we didn't even mind that they spelled the name of the main character wrong. This is just wonderful news. This is our book, about a regular guy in Brazil without super powers, that's not a zombie and that have not been turned into a major motion picture. It's just our book, and apparently people want to read it. It's been quite a trip, one day at a time. The Daytripper Challenge continues. After an entire week receiving pictures from our readers, I can't help but think that comics, being such a personal reading experience, should inspire an equally personal reaction and response, and I think anybody who can lose a little bit of the day to take a picture and send over the internet across the world when they didn't have to, and to somebody they never met, is creating this wonderful aura in which we can all appreciate comics and the power that stories have to make us want to do something, do better, and do more. Jamie Heron bought Daytripper in a Kinokuniya bookshop in Sidney, Australia. Apparently, he liked the book so much that the tried to smile. Do you think he was successful? Thanks anyway, Jamie. Dave Trendell lives in Buckinghanshire, in the UK, and was bummed that there wasn't a Hard Cover edition of Daytripper, but he was happy when he discovered Gosh! Comics, a great comics store in London, had an exclusive bookplate edition, so he ordered his online. And he works on a school and will, according to his words, "make sure all the English Teachers at the school I work at get a chance to read a copy! ", which I think is awesome. You're awesome, Dave. Yeyé Agudelo lives in East Hampton, NY, and sent a picture of her Daytripper book, which she ordered through Amazon. As you can see in this black and white picture I included to go along with the picture she sent, she's friends with Ana Cristina, one of our earlier challengers, and we had met them both at NYCC last october, but since at that time they were disguised as Umbrella Academy kids, it took us a little while to put two and two together here. I look at their pictures in NYCC and the pictures they sent us and them I start to think if only a mask can really change somebody's face and appearance so much as to protect their secret identity. Today is Valentine's day, day for lovers and for love in general. When we came up with our Daytripper Challenge, we did it to spread the Daytripper love, to make people curious about our book and, maybe, curious about other comics in general. You never know what you'll discover when you go looking for new things. There was no better way to celebrate our fun challenge in Valentine's day than to receive another picture, one that is actually two, and that came from a lovely couple. Rose and Eric took this picture at a Barnes and Noble somewhere in sunny California, and I'm really happy they decided to send it together. Even with a shy out of focus Eric in the background, don't you think they make a cute couple? Do something romantic tonight. Buy somebody flowers, smile at a stranger, give your girlfriend a naughty blink of an eye. Tomorrow, grab your camera or your phone and come join us on the fun. This is fun, and interesting. We put the first picture of our Daytripper challenge up, and then we got three more pictures. None of them come from the same city, state or even same country. That's the daytripper love spread all over the world. Ana Cristina Muñoz sent us a picure from her favorite store, Showcase Comics in Bryn Mawr, Pennsylvania. Paul Hardaker sent us his picture from his local comics shop, Destination Venus in Harrogate, England. And he has the cutest kids. Michele Foschini, from Italy, sent us a picture of the Italian edition of Daytripper, for which I believe he was the translator. A shy guy, he kept himself away from center stage and shot only the shelf, which make us appreciate that the italian edition has a nice hard cover. And he sent his picture via Facebook, and so can you if emailing sound too complicated. Thanks to all of you who have sent us pictures. You're beyond great. Some times we get more than we asked for. As this week saw the release in book stores of the Daytripper trade (that has been available in comic book stores since Febuary 2nd), we decided to have a little fun and we made our Daytripper Challenge video, inviting people to take a picture of themselves at the place they found and got the book and email it to us. We would put these pictures here on the blog. Well, we got our first picture. It came from the Philippines! Danry Ocampo took this picture on his local comics store, PlanetXComics at the Trinoma Mall. I have never been to the Trinoma Mall or anywhere else in the Philippines, but it's great to see our books have crossed oceans and one very distant fan got us really excited sending us a picture. And how cool is it to see a copy of Casanova:GULA #2 on the shelves behind him? It's a bonus. 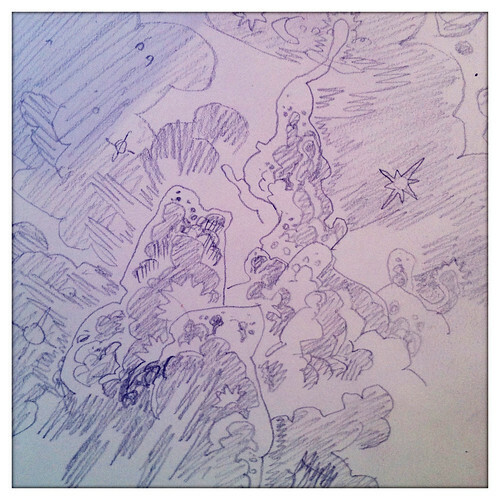 Above, the last page of my sketchbook. Below, a sketch Bá did this week as a preparatory study for a scene on Casanova. It's good for us to be drawing at the same time, even if in completely different things. There have been great reviews and interviews about Daytripper all over the web, and we couldn't be happier about the response from everybody. Over at the Vertigo blog, Pamela Mullin gathered most of the links in one nice post, and one of the links even includes the wonderful introduction by Craig Thompson, a treat all in itself. 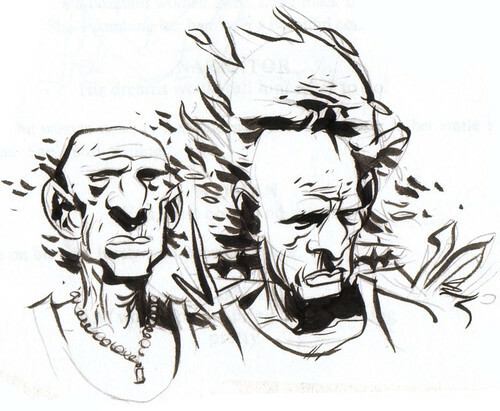 Also at the Vertigo blog, in order to celebrate the release of the Daytripper trade, Bá and I wrote some blog posts, telling a little about the influences, the process and the some of the events that inspired our little tale, and we also showed a lot of sketches. So, click on the links if you want to hear about a trip that inspired and guided one chapter of the book; or if you want to see sketches of the characters and the settings; or maybe if you rather hear about how characters getting a life of their own. I read a nice write up about Daytripper on a NPR blog here. We gave more interviews recently, so more of these things should pop up here and there. I hope I remember to link to them, but if I forget, I'm sure Pamela will. So, back to work in here, hoping a lot of people are discovering Daytripper, and curious to see how many will really answer our Daytripper challenge and send us pictures of the bookstores and comics stores and friends shelves and school libraries where they found our book. 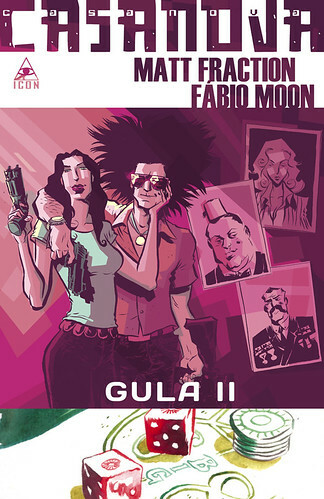 Today, Casanova: GULA #2 comes out in comics stores. It's one of my favorite covers, featuring that crazy couple, Zeph Quinn and Kubark Benday. You have to pay attention in this issue, as important information is shared that relates to the brand new Casanova stories Bá and Matt are working on right now. Last week, the Daytripper collection came out in comic book stores, for everybody to find, buy and share with their loved ones. Some people ordered it through Amazon, and then they saw that it was only going to be available on February 8th. In the same fashion, regular bookstores would only get the book and start selling it on the same date. So, the direct market gets a one week head-start, and we should take care of our direct market and the comic book stores, but now there are a lot more venues where you can find Daytripper. Now, people who doesn't usually buys comics - or who at least usually doesn't go to a comic book store - can bump into our book and discover it for the very first time. I believe there are a lot of potential readers in bookstores, in movie theaters and everywhere in general, and they just don't read comics because they don't know the variety of stories that are being told in comics form, some of their liking for sure, so the more we can have our book along with other books, the better. I think that that's what Steve Niles called "reaching out of our bubble" on this blog post, and I couldn't help but agree with him that there must be a more positive approach to our support to Creator-Owned stories than just complaining. That's one of the reasons I made this video. I also made this video because it was fun, and it reminds me that making comics is also fun, and it's supposed to remind readers - and specially those who venture themselves to bookstores with their cameras and phones in hand (I trust you, guys!) - that reading comics and discovering new stories is also a lot of fun. The challenge has been set. I hope a lot of people join in. Odoyá, Iemanjá. Thank you for Daytripper. 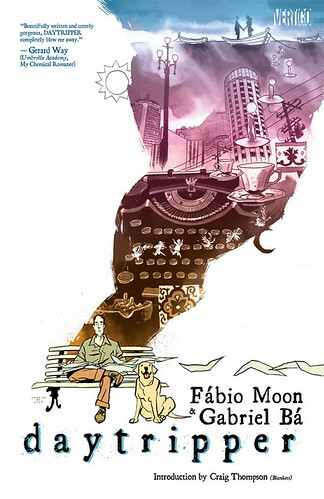 It is also the day that the collected edition of Daytripper comes out. There's not much left to say about the story, about the book. People love behind the scene facts and informations, and that's why we keep this blog, but I don't feel good about explaning the stories, telling my reasons for doing this or that, because I believe it weakens the story. I tried to say the least I could before the series started in December of 2009 and I didn't want to keep talking about it during the series. Today the book will be at the stands of comicshops throughout the USA, a few days later on every major bookstores of the country and soon enough world wide. I'd like to think the book can speak for itself. That's what good stories do. I hear about authors who don't read their own stories once they're ready, directors who don't watch their movies. I love comics and I look back to everything I do. I love what I do. It helps me keep track of where I came from. If I do these books I do today and tell the stories I do, it's because of all this other stuff I've done before and I can never forget that. If you have read the series and liked it, tell a friend about it, or even give it as a gift to someone you know. If you haven't read it, I hope you do. This story represents our love for comics and I'd love if you could help us spread this love. All we need is love.